I don’t know about you but meal time at our house has at times been a struggle. We talk to our kids about how good foods are good for our bodies and make us healthy and strong. Can you see those muscles? Our rule at the dinner table has always been if you want a dessert or treat of some sort you have to finish what is on your plate. I feel like this is very realistic because I know my kids and what they can eat. I never put more on their plate than I know they can handle. But, I also know, sometimes you just aren’t very hungry. So they are given the choice. They have to try a bite of everything but if they are not hungry beyond that then they are not forced to eat. And fortunately, dessert is typically enough of an incentive. However, lately my oldest has been choosing not eat a lot more often. So I decided to come up with yet another incentive. 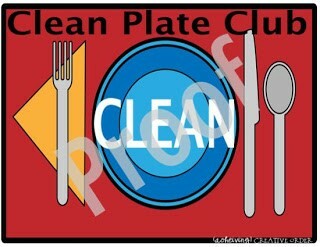 The idea is that when they finish their meal, not only do they get a small treat but they get to become part of the “Clean Plate Club” and color in a letter of the word “CLEAN”. Since their laminated, the erasable marker wipes right off so we can start again.